It was September 1998 when Aerin Holt and Marti Marshall came to my studio to ask if I could compose the music for a new ballet they were planning. It was to be called, “The Snow Queen,” based on the classic tale by Hans Christian Andersen. Now I’d never composed music for a ballet before, but figured this was the perfect opportunity to start! And so began a most amazing creative journey. 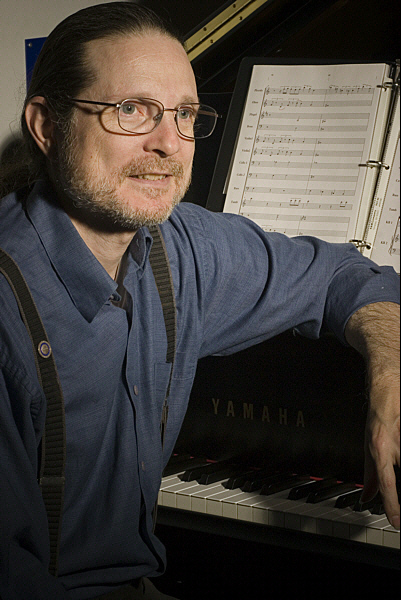 Needing help in the area of classical music appreciation, composition and orchestration, I enlisted the artistic talents of Carol Worthey to be my mentor in this regard and I met with her for several consultations. Her guidance was exactly what I needed to open my universe to the possibilities of the genre. I was also a big fan of Rene Dupéré (the original composer for Cirque du Soleil) and I wanted to mix classical with contemporary world and ethnic music, much like Rene was able to do for that seminal first production, “Le Cirque Réinventé” in 1987. I read over the scene descriptions and got some feedback from Aerin and Marti about the characters, the moods, time signatures, tempos, and desired length of each piece. After Aerin and Marti left, I started to work on the theme for the Snow Queen character. This is first heard as the last section of the Prologue, and is reprised in different forms and moods as the Snow Queen goes through changes throughout the story. It is a beautiful and sad piece that underscores the pain the Snow Queen has just endured after the smashing of the Magic Mirror into millions of tiny pieces by the evil sorceress. This first piece turned out so well I made the decision we were NOT going to need any classical music by the masters! I was now challenged to make the impossible possible! It was amazing and empowering, creating the universe of The Snow Queen Ballet with music. Each Sunday, I dove into that world, creating one scene, then another. Aerin kept me on track with urgent requests for various music cues for different scenes. During the week, I would listen to my ideas and outlines while driving, formulating orchestrations in my head that would be realized the following Sunday. All this time, I never saw the dances that were created with the music until two days before opening curtain! And when I did see that dress rehearsal, I was blown away! So was everyone else who attended “The Snow Queen – ballet redefined” that first year (and the second, and the third, etc., all the way to the 16th season in 2013!). It turns out, we actually needed about an hour-and-a-half of music, and with the year 2000 addition of the narrator character telling the story between set changes, and the intermission between Act One and Act Two, the show settled in at about two hours. Adults and children alike were enthralled with The Snow Queen Ballet (which is really a lot more than just ballet; there’s acrobatics, modern dance, hip-hop, gymnastics, and the Snowflakes!) and told all their family and friends about this amazingly magical show, resulting in sold-out performances, standing ovations, TV coverage and front-page feature articles in the Los Angeles Times Calendar section and Verdugo Magazine. 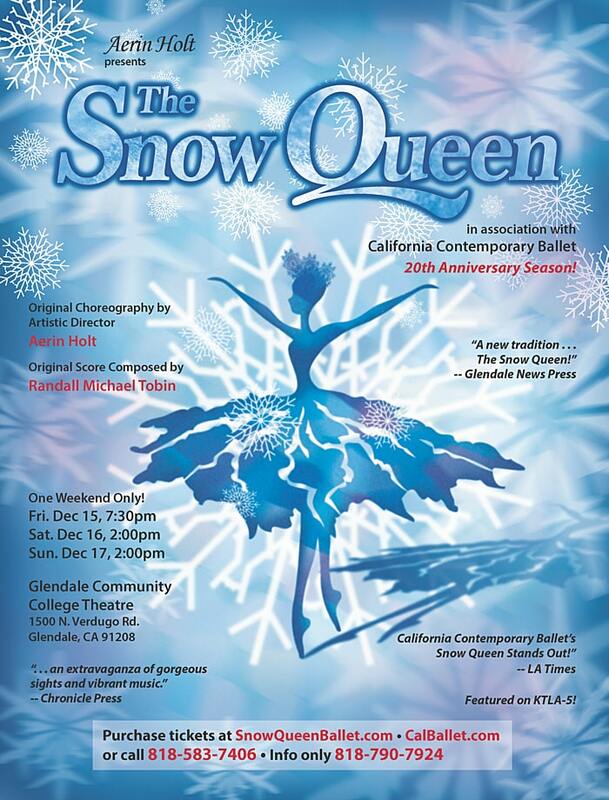 Come celebrate the return of The Snow Queen Ballet to Los Angeles at Glendale Community College Performing Arts Theatre, December 15th at 7:30 p.m., with matinee shows on the 16th and 17th at 2 p.m.
Have a most enchanting and magical holiday season!